Below is a picture of an extra year student of Obafemi Awolowo University (OAU). 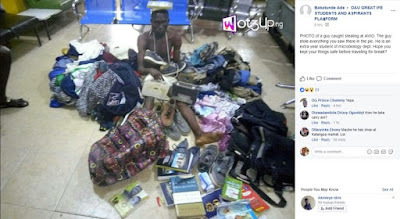 He is said to have stolen all the items he is pictured with from Awo Hall of the University. 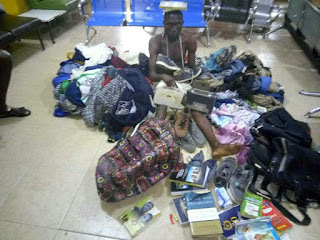 PHOTO of a guy caught stealing at AWO. The guy stole everything you saw there in the pic. He is an extra year student of microbiology dept. Hope you kept your things safe before traveling for break?